All engines run on an optimum fuel to air mixture called "stokiometric" which means chemically balanced. This balanced fuel to air ratio is 14.7 to 1, 14.7 parts air to 1 part fuel. The oxygen sensor is created using the active chemical such as zirconium, electrochemical (also known as Galvanic), infrared, ultrasonic and very recently laser. 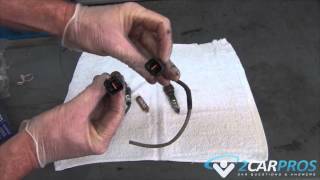 When a lean mixture code is detected by you or a technician the first tendency is to replace the oxygen sensor. The best way to check the operation of the sensor is to run a simple test. No matter if your engines oxygen sensor has one wire or four there is only one sensing wire that feedbacks information to the computer (PCM). To find this wire you will need a car repair manual. If a trouble code is present that pertains to an oxygen heater sensor failure, replace the sensor to repair the problem. 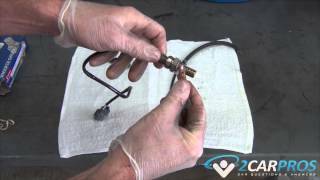 An oxygen sensor must be warm before it will operate properly. Note: If a malfunction exists with related components such as an engine misfire or engine vacuum leak do not perform this test. The oxygen sensor is designed to operate within a particular range, if this range is exceeded the sensor will give the appearance that it has failed. Step 1 - Once the oxygen sensor sensing wire has been located connect a volt meter to the feedback wire and ground. Select the millivolt operation on the voltmeter. Step 2 - Next, start and run the engine at idle until warm (about 15 minutes). Observe the voltmeter; it should bounce slightly at whatever voltage the sensor is centered at (about 150 millivolts). Step 3 - Continue to observe the meter and have a helper rap the throttle. The meter should drop for a split second as the mixture leans out in the first milliseconds of the throttle bore being opened. Then quickly rise for a spit second as the throttle closes and the mixture richens. The volt meter should stabilize at the original operating voltage when the engine returns to idle.